Fru-Gal.org: Free Revlon Nail Clippers and Emery Boards @ Rite Aid! Free Revlon Nail Clippers and Emery Boards @ Rite Aid! Rite Aid is redeeming it's blah week with some free Revlon Beauty Tools! 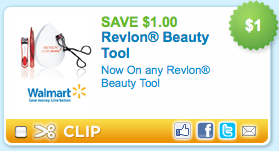 Print the $1/1 Revlon Beauty Tools Q and use it to get free nail clippers or emery boards which are currently 40% off @ Rite Aid (nail clippers = $.87; emery boards = $.75). Add these to your OCC shoe boxes for older girls! P.S. Print this coupon through Swagbucks to earn 10 Swagbucks!